Social media can take over your life. If you’re a social media marketing professional, there’s a good chance that you got your job because you’re a social media addict outside of work, too. Once it becomes your profession, you find yourself on Facebook, Twitter, Instagram and more, all around the clock. Your ethics become redefined by this bubble, you care disproportionately about impressing your social media peers, and you see little red hearts floating through the dark whenever you close your eyes. But the thing about it is, it becomes so normal that you don’t even notice that you’ve fallen into this rut. This is why it can be super-useful to be aware of a few warning signs. Identifying the rut is half the issue – once you’re honest with yourself about needing to shake things up, all that remains is to cook up a solution. One persistent ‘rut alert’ for social media marketers is that you find you can’t see beyond your working day. Rather than anticipating good times to come, you think only about work and sleep. It doesn’t mean you need to quit your job – though a bit of time off wouldn’t hurt. But it does mean you need to be a bit more pro-active about the way you relate to the world around you. If you work in a team, take a bit more time to get to know what the others are all about. If you work from home, try being more mindful about the environment around you – both in your work room, and in your neighborhood. Things can seem a bit more meaningful and alive when you remember that Tweeting and posting aren’t the be-all-and-end-all. 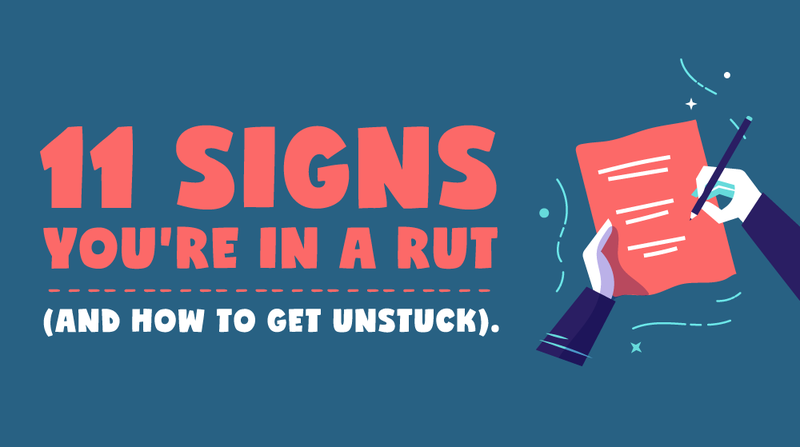 Here’s a look at some of the other warning signs that you’re stuck in a rut at work – and some ideas on what you can do get out of it.